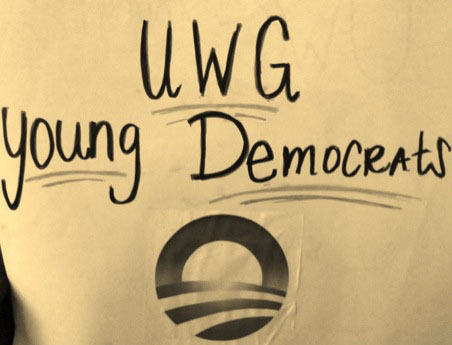 With the presidential election right around the corner, many UWG students are getting political. Students are seeing firsthand just how the political sphere can affect them before Election Day even arrives. Last Thursday at 10 p.m., the UWG Young Democrats held a watch party for President Obama’s nomination acceptance speech during the Democratic National Convention. Students and faculty gathered in room 118 of the Pafford building to watch members of the Democratic Party speak on the President’s behalf and to hear the President accept his nomination for candidacy. Vice President Biden gave the President’s introduction and the First Lady, Michelle Obama welcomed her husband to the stage. The room was silent as the students and faculty listened intently to all of the speakers. The UWG Young Democrats are led by their own President, Ekeoma Nwakanma, and are a student organization that promotes knowledge of campaigns and voter registration—predominantly in the democratic sphere, but all students are invited to join regardless of their political stance. The UWG Young Democrats are also planning to co-host a student voter registration drive with the Political Science Club. Nwakanma says that the organization is definitely political, but it’s not the “harshness of politics” that the organization stands for. “We have discussions about what you like about politics, what you don’t like about politics and upcoming candidates and their policies,” she said. Their faculty advisor, Dr. Robert Sanders serves as a source for public outreach. Sanders is a chairman for the Executive Committee of the Carroll County Democratic Party and the UWG Young Democrats help by promoting their monthly meetings. Sanders actually had tickets to the Democratic National Convention on Thursday in Charlotte, North Carolina, but was denied the trip due to inclement weather. Last Wednesday the Democratic National Convention Committee announced that Thursday’s DNC would be moved to the Time Warner Cable Arena instead of the original outdoors location due to inclement weather, causing 65 thousand ticketholders to lose their opportunity to attend. Another ticketholder, Scott Smith, a graduate student of the Psychology Department, was also unable to attend due to the change in location. Smith said that he actually stumbled upon the opportunity by chance. This commuter student from LaGrange worked with the Troup County Democrats and caught wind of a bus to the DNC being chartered by the Georgia Federation of Democratic Women. One of the members had an extra ticket to the event so Smith essentially only had to pay the $40 for the bus ticket. This convenient opportunity was unfortunately spoiled by the prediction of rain. Smith, however, wasn’t bitter about his loss. “I’m disappointed but I understand,” Smith said. “Even the President can’t control the weather.” He and 65 thousand other ticketholders are being invited to see the President at some other event before the election in compensation for not being able to attend the DNC.